The Irish certainly know about hard times. That's how the "Luck of the Irish" was born. The term means an abundance of blessings received after great difficulties, a flowing shower of prosperity renewing our faith in the possibilities for our own blessings to come. But why the Luck of the Irish? It's not like others haven't had their share of insurmountable challenges to overcome, they have. The Irish embody a unique quality, a powerful energy: unflappable faith. Oh, it's true that we can also be a "wee bit" negative (can you say Blarney? ), but even in the midst of the worst difficulties we Irish have an unbreakable belief that someday, someway, somehow, somewhere, someone will finally have peace and prosperity and if we just wait things out long enough, it will eventually be ourselves basking in the glow. It's the reason Irish eyes are "smilin"...for no matter what they twinkle with this deeply embedded surety. It's no secret now, times are tough all over. We know this because television, radio and internet marketing tell us so. They tell us we must be smarter, more efficient and practically clairvoyant to grasp any possible business. And even if we're able to do everything perfectly, any possible business and profits will be slim. Of course even if business is good for us right now, eventually we too will feel the crush of declining sales. That's what they tell us. Yet even in the Great Depression fortunes were made. So do things really have to be so difficult now? No, frankly they don't. In fact, the opportunities for prosperity are better now than ever before. But most everyone in sales are getting out their how-to manuals and buying "cutting edge" programs so they can be up on the latest techniques. Marketers are eagerly developing new and more intricate ways of connecting with prospects and getting them to cough up their contact information so they can "capture" the sale. Everyone...or so it appears...is grasping, lamenting and wondering. Even those who had some nest egg and fairly steady business are cutting corners, holding back and holding on tight to whatever business they had hoping to ride things out just long enough to survive. Techniques are not the answer. Even the best technique is merely a bandage, covering symptoms of the real challenge. So what is that challenge? This month's Living Lessons reveals an oft-ignored aspect of sales that's actually the single most important factor for success! Here's a hint: it has to do with your vibrational signature. And if you think you're not in sales today, guess again. Remember, sales is not just for the sales, marketing and customer service team. EVERYONE from secretaries to accountants, waiters to artists are in sales, always. We ALL have to sell our services every day. Today, St. Patrick's Day we're celebrating my own family heritage. Of course with a name like Cathleen and these green eyes, rarely do I get mistaken for anything else. We're celebrating tenacity, perseverance, creativity in the face of great obstacles and great fortune after difficulties. A wonderful message for these times indeed. Do I have the Luck of the Irish? You bet! Ask any of my family or friends, there's always something amazing happening to me. No matter the situation, it seems that people go out of their way to give to me, help me, bless me. And it seems that way because it's true! But as my clients learn...my "Irish luck" is really effective vibrational management...manifesting in Living Harmony. You see, my overall vibrational frequency is all about abundance. It's true I have my challenges and hard times. But by managing my energies, I'm easily able to process what's going on in the present while growing my positive vibrational frequency for even more abundance in the now as well as my upcoming future. So often we concentrate on only one aspect of the challenge we so desperately want to fix. Unwittingly we mistakenly turn ALL of our energetic resources toward what is happening right now, lowering our vibration and drawing more of the negative to ourselves making our difficulties last longer or worse, causing them to grow bigger. Imagine standing before the beautiful rose garden you have lovingly created to discover a patch of weeds. Would you really pour all your attention into dealing with the weeds feeding them with your energy while ignoring the needs of the roses entirely? Of course not! Your prized flowers would die. But that's just what we do when facing our challenges, or even worse, when we're working to manifest what we deeply desire. We say we want success, yet we spend most of our energetic resources including our time and attention on what's wrong, what we don't want. Then we wonder why business indeed dries up, we don't have the relationships we want and our health is poor. In reality, when facing garden weeds you may have a moment of anger or worry, but of course you'd simply take a breath, release those feelings, bend down, pull out the weeds for only the time it takes to get as many of them as you can out. Then you'd turn the rest of your attention to pruning, feeding, watering and supporting the growth of what we do want...more beautiful roses. That's all there is to growing a prize-winning rose garden. And the truth is, that's all there is to manifesting anything! In "these times" most are desperately seeking how to fix the problems they think they have with that new technique. Most even view having to find new clients a challenge rather than the tremendous opportunity it is! If all we're doing is problem solving we're not growing. And a business that isn't growing is dying. From an energy perspective what we're doing by concentrating on all the bad is actually sending out that signal to the Universe. When we feel fearful and worried, the Universe simply must give us more experiences, more evidence to support these feelings. By holding onto our fears we're actually feeding into them! Some people feel their feelings more acutely, while others are easily able to "deal with" their feelings. Don't confuse not feeling feelings acutely with not having them. Check your thoughts. If you are thinking anything like "business is tough" or any other lack-based thoughts, you've got the feelings in there anchoring them to you like a magnet. You're actually magnetizing negative results to you. But the good news is that you can release any feeling or thought, and best of all any negative energetic pattern. You can actually shift your vibration to magnetic abundance. PS: Read on to find out the secret to Living Harmony Sales Success in this issue's Living Lessons. PPS: Don't stop there! Once you learn what the secret is...you still need to know HOW to manage and release so you can put into successful practice all those sales techniques...call or email me to find out how you can have results like some of my clients. Visit www.inlivingharmony.comto find out just how easy it is to Manifest...in Living Harmony. 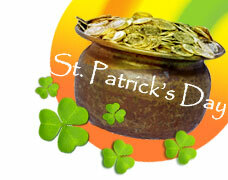 *St. Patrick's Day Blessings on you! Are you looking in the right place to find your Pot O' Gold? You're seeking to understand your ideal customer, your marketplace, your competition and everything else you can think of in order to hopefully put yourself in the right place at the right time, so you can grab as much of the little business there is. The competitive fight is tougher, closer and more difficult than ever before. But what if you're looking in the wrong place? Now more than ever we need to be looking to OURSELVES for the available business. While we of course need to know the real facts and most effective techniques, the inevitable truth is that no matter what the industry...people buy from people. Period. No matter how many departments get involved in the sale process, how many budgets or how many sales presentations, etc. in the end, it always comes down to someone connecting with someone, an expectation of trust and fulfillment of need. How do we connect? We communicate with more than just our words and body language. In fact, we're constantly transmitting messages vibrationally. We send and receive far more information in every moment than we're even consciously aware of ourselves. And what we don't manage consciously can hurt us, and hurt our profits. There's a simple way to know what you're transmitting: take a look at the reality you're experiencing. If your reality is anything other than abundance, you're transmitting that lack, not consciously of course but it's there. We may have a fabulous poker face, and think that we're okay because we're not acutely feeling that terror that kept us up the night before, but our customers feel it and it damages our sale! Our presentation is flawless, the marketing is state-of-the-art, the product is essential and the price is right. We don't see how what used to be an easy-going demeanor has shifted to an over-explaining, insistent voice. We're surprised and frustrated when the client starts turning us down, or takes an agonizingly long time to make a hesitatingly small buy. We're left wondering what other technique could we employ? We lament how just a few months ago we felt so "in the zone" and now...we're unaware we've completely changed our vibration by concentrating on the fearful messages of a declining economy. The truth is the "zone" isn't a magical thing that happens by mistake. You really can get in the zone, stay in the zone and be the rainmaker you want to be! It's not only not that difficult, it's really your natural state. You were born to grow, to experience abundance and to have the fullness of all the Universe offers. You were born to manifest abundance. While you do need to keep up with the tangible world...new methods, innovations and inventions, your real abundance can only come from the confident energy you embody and thus transmit when you're at peace, secure and feeling that lucky feeling. Your real abundance will come when you learn how to clear your way into the zone, permanently. Living Harmony Sales programs provide my clients with an unbeatable formula: my world-renowned expertise in energy management combined with over 2 decades of my own proven sales and marketing success know-how. One of my greatest joys is not just supporting my clients in learning how to create exponentially greater success than ever before and but even better, to make that success their new consistent reality. Stop struggling and start magnetizing success to yourself and your business...in Living Harmony. Living Harmony Success Zone now. WHAT DOES ENERGY WORK DO FOR YOUR SALES LUCK? All energy modalities, including aromatherapy, simply help us to clear stuck energy, charged emotions and thoughts so that we can reframe our programming and experience life in more happy, harmonious, productive and prosperous ways. *60%, 100%, 500% or more increase over the previous year's profits - with less work, cost and stress! *Web site statistics that consistently outperform the standards - 4 minute stay per page...40% conversion rate...and more. What are we going to manifest for you? Visit www.inlivingharmony.comto read real-life results and learn how you can Tap Into the Power...your own! The Living Harmony logo was born not just out of my love for Celtic art, but out of a unique understanding of the Law of Attraction born out of my need to heal my own chronic and overwhelming back pain. In the process, I not only cured myself of this dreadful pain but learned the actual how-to of the secrets of manifesting...anything. One of those secrets is that our minds operate on questions. Questions in, answers out...reality felt. Because our minds operate on questions, we can use them to create the reality we really want instead of remaining victims to the rollercoaster of life's good and bad days. When we're asking over and over, "why am I so worried?" and our subconscious mind draws in answers that give evidence to the question. We're "so worried" because...business is bad, the economy is tanked, sales are slow...etc. Better questions mean better answers. Learning how to create productive, vibrationally positive questions is an essential skill to mastering the Laws of the Universe, especially the Law of Attraction. One of the most effective things you can do to support your success is learn how your mind works (yes, we actually know now!) and begin using that vast resource in a consciously intentional manner. Especially in "these times" you can learn to create your own Irish Luck by managing all your energies, especially your thoughts. Young Living produces the highest-quality organic essential oils and oil-enhanced products in the world. Using the power of nature's fragrant molecules to be free of every day problems, for love and business...in matters big and small...aromatherapy can be used on its own, but when combined with other healing modalities such as EFT, these powerful essential oils increase the effectiveness creating supercharged healing and release.